Annelies Richmond is an international trainer of mindfulness, meditation, and leadership development programs through the International Association for Human Values and the Art of Living Foundation. Annelies has trained over a thousand meditation and leadership teachers in five countries and has been meditating and practicing mindfulness techniques for 20 years. She is also the founder and director of Sky Campus Happiness Program, which is a national university leadership and well-being program, through which she trains and empowers student leaders to become meditation and well-being facilitators for their campus. 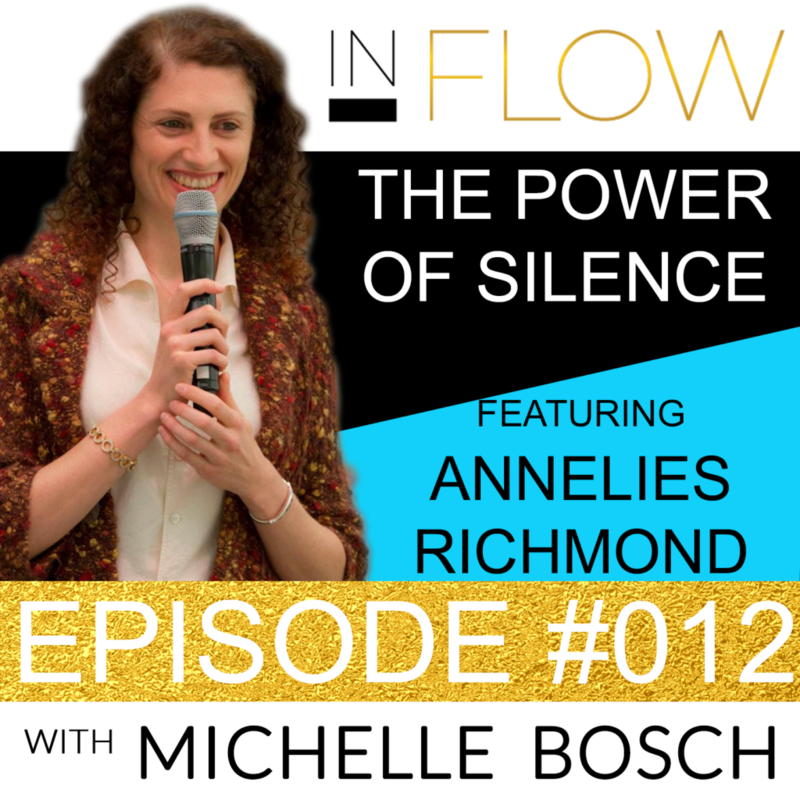 In this episode, Michelle Bosch chats with Annelies about Sudarshan Kriya – a powerful yet simple rhythmic breathing technique that incorporates specific natural rhythms of the breath, harmonizing the body, mind and emotions. This technique is the cornerstone of The Art of Living, which is the course that Annelies teaches. Find out how to find silence, and how this will improve your life! When you have broader perspective and you’re more in touch with your actual purpose and what things are not part of your purpose, you become a much more powerful and purposeful human being. 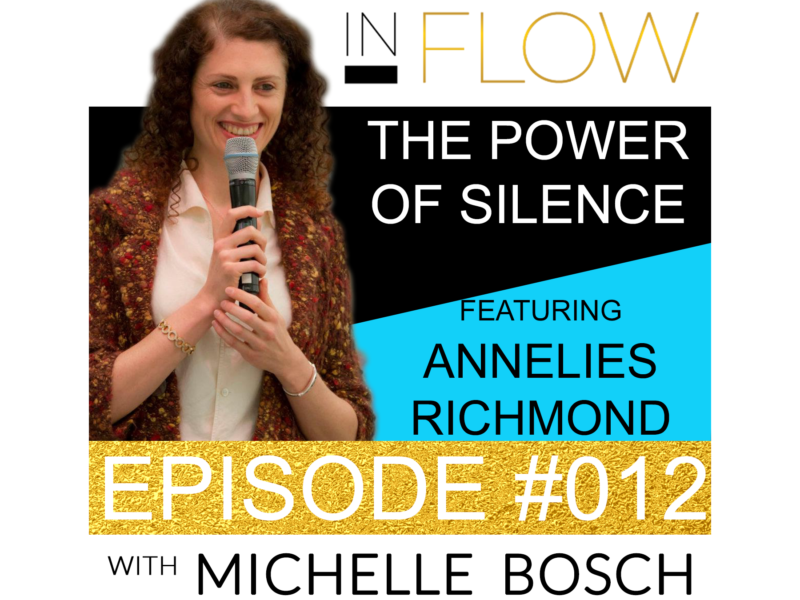 Michelle: Welcome to the “In FLOW” podcast. I am your host, Michelle Bosch. I see a gaping hole across society that focuses on the outer work and forgets about the inner work when what we really need is to bridge the gap between prosperity and spirituality to live a life inflow, with inflows of light, inflows of cash, inflows of creativity, inflows of grace in our life. Each week, join me for powerful messages and interviews that will leave you inspired and ready to step into flow in your higher work. So now, let’s go. Welcome to the “In FLOW” podcast. I am your host, Michelle Bosch. I am very excited about today’s episode. I have a very, very special guest here with me. Her name is Annelies Richmond, and I would like to tell you a little bit about Annelies. She is an international trainer of mindfulness, meditation, and leadership development programs through the International Association for Human Values and the Art of Living Foundation. She has trained over a thousand meditation and leadership teachers in five countries. She has been meditating and practicing mindfulness techniques for 20 years. She has started using these practices daily during her 15-year career as a professional ballet dancer with the Metropolitan Opera in New York City and found that they enhanced that not only physical stamina and capacity but also mental clarity and emotional resilience. She is also the founder and director of Sky Campus Happiness Program, which is a national university leadership and well-being program, through which she trains and empowers student leaders to become meditation and well-being facilitators for their campus. She travels across the U.S., teaching, and lecturing at institutions such as Yale University, Purdue University, UPenn, MIT, Northeastern University, Columbia University, the United Nations, and Google. Wow, Annelies, welcome. That is impressive. Thank you so much for being here today with us. Annelies: Oh, I’m really happy to be here, Michelle. Thank you for inviting me. Michelle: Yes, I know that you’re constantly traveling the world teaching. And I am so, so grateful that you’ve made the space for us to have this wonderful conversation today. And one of the reasons why I brought you on is I have been following the Art of Living Foundation for some years now. And I have been using some of the tools that you teach. And they have helped me and have been so instrumental in helping me find flow and vitality in both my business and my personal life. And these tools really have affected my P&L. As entrepreneurs and business owners, we’re always figuring out what’s the return on investment. And I can say that in terms of these practices directly affecting my ability to come up with ideas, better decisions, have clarity, and be much more efficient, I can say that they have definitely gone straight to the bottom line. So I would like to talk a little bit about that and just start asking you, perhaps, if you could tell us how you came to the Art of Living Organization, and how did you get started on your journey. Annelies: Yeah. Sure. So, I had moved to New York. I had been living in the middle of New York City for less than a year. You know how crazy it is living in New York City. And I was a working professional, a professional dancer, and I was just interested. I was looking into…I guess I was looking into meditation as a way to center myself and re-energize myself and have a way to live in such a crazy city, where I could step away and rejuvenate and come back clearer and stronger, and also as a way to approach my career with more confidence, because in New York, it’s a bustling city. It’s all about work, work, work, and creative. It’s so creative. And if you start comparing yourself to others, you really get lost in that city. Annelies: Yeah. And I said, “Okay, I’m gonna try it.” And it was amazing. He was right. I went in there for four days. It seems so short. It was like Friday night, half a day Saturday, Sunday, Monday night. And at the end of those four days, I felt incredible. I felt everything was like completely recharged, body, mind, spirit emotions. I didn’t expect that. I thought I was just gonna learn a nice technique or practice. And he’s like, “Yeah. You should definitely check it out.” And the next day he comes up to me again and he actually offers to me, as a gift, a book. Something I think into infinity or something like this was the name of the book. And I start reading it. Because it’s a three-day event, so I was already like a few chapters in it. And so on the third date, I’m like, “Oh, my God, I’m really enjoying this book. I love it. I’m really, really interested in this. Perhaps you can help me find when the next Happiness course is happening.” And he pulls up his phone, and he figures out that within a few months, there was gonna be something happening here in Phoenix. And that’s how I came to my first Happiness course here with like the local chapter. Here in Phoenix, I think it’s now led by a gentleman of the name Satish, I think. I can’t remember his last name right now but yeah. And so that was my beginning as well. And I can totally echo what you just mention about. I think it was shorter by the time I took it maybe. I think it was maybe two or three days, maybe. And it’s just for a few hours each day. And it was something that I was so intrigued by because it was all about just my breath and your breath is portable. You can take it wherever in whichever situation and really use it. So tell us about the breath work, about the Sudarshan Kriya. What is it that it’s doing and just tell us the mechanics of it? What’s happening to our nervous system? Why are we feeling so great after we do something like this? Annelies: Well, first I’ll tell you my personal experience. So I was like you also. I was already practicing yoga. I was taking, like, three or four yoga classes a week, which is a lot that I was doing that as a dancer to balance out my body. Yeah. I felt like such an incredible difference, taking the Happiness program and learning Sudarshan Kriya like it was so much beyond what I would feel from yoga classes. So that blew me away because it’s actually from the same tradition. It’s just the depth of the yoga tradition. It’s what you’re supposed to be studying also. Yeah. So Sudarshan Kriya is really the cornerstone practice that you learn through Art of Living at least in the first level of classes in the Happiness programs. And I just remember feeling like I went into this effortless, incredible meditative state. And I had no idea how I got there. And I was just like floating in this incredible state. And I was like, “This is like magic. This is what everybody would like to get to, at least as a way to step away from their crazy life.” And it was so easy. So, one of the main ways it works is that your breath is intimately linked with your state of mind and your emotions. And most meditative practices or journeys are not using this power of the breath yet. The founder of Art of Living, Sri Sri Ravi Shankar, he’s a great yogi, like he’s definitely a meditation master. And he’s pulling some things that are so old from the yoga traditions. There are references to practices like Sudarshan Kriya thousands of years ago in old texts on yoga. So he’s pulling stuff that has been working for thousands of years and somehow is just now resurfacing. But if you look in your own life, you’ve already noticed that your breath is intimately connected to your state of mind. It’s like when you’re angry, how do you breathe? Have you noticed? Annelies: Or when you’re sad. And we have this long exhalation, or when you’re happy or joyful or in a pleasant state, if you really pay attention to it, the inhalation is actually longer and pronounced. So there’s this really incredible phenomenon that’s happening in our system all the time automatically. And that phenomenon is that every emotion or state of mind that you have has a corresponding rhythm in your breath. And normally, it’s an unconscious function. You’re in a state of mind, you’re irritated, or whatever, and your breath starts going in a certain pattern. And that dictates to your physiology, and it lets certain hormones come out. And a lot of times what happens is our system stays stuck in that state. Notice when you’re irritated. You often stay irritated for hours. But when a child is irritated, it’s like a minute or maybe a couple minutes and then gone. They’re smiling and laughing. We were born with such a flexible nervous system. We were not born to hang on to anger for days and days and days. But over time, as we accumulated more and more and more stress and we stopped becoming conscious of these incredible patterns in our nervous system, how the breath can change the state of mind, then we started to get stuck in emotions. And that’s actually one of the things that make us the least efficient in life because we’re so stuck in an emotion and emotions rule our intellect. So we’re not able to be as creative or do as much as we wanna do or be as productive because the emotions are ruling us. So, to me, a technique like Sudarshan Kriya brings so much freedom in your life because you have a tool to take care of your emotions and cleaning them out of your system becomes balanced. And it’s also a tool that helps you keep being resilient during the day. Even when some really intense event happens, you’re actually more resilient. In a way, your emotional body becomes stronger. But the secret is in the breath. Sudarshan Kriya is not only a meditation. It’s also described as a cleansing technique. And it’s why you have to learn it from an in-person instructor. You can’t only learn that technique online because it’s very powerful. And you use different rhythms, very specific rhythms in the breath to clean the stuck emotions out of the system and to help the restlessness in the mind get quieter and quieter. And really, it cleans out the system, whatever needs to get cleaned out and restores your body to balance. So that’s really what’s happening. In Sudarshan Kriya, all your systems are getting stimulated. Your circulatory system is stimulated. Your immune system is…your endocrine system is stimulated, everything, even digestion. People say afterward, “Oh, I have such a strong appetite.” It’s like everything gets stimulated through the use of the breath and through the use of… in yogic terms, it’s called prana. You’re actually affecting the prana, which is the life force energy in the body. And when you do a technique that raises the prana and brings the mind into a meditative state, then you’re in, like, the ideal state in life, like when you look at kids, you can almost see the energy coming out of them, right? In yogic terms, you would say their prana is so high like their life force is so high. And sometimes you see an adult and they look so tired and the face is pale. There’s no circulation. And it’s like the prana has gone down, down, down. It’s gotten less and less and less. And as adults, we need to learn a way to raise that life force energy again in our system. So this is one of the reasons why Sudarshan Kriya, or it’s called Sky in the research literature, it’s why it’s so powerful because it doesn’t just put you into a meditative state but it raises the prana or the life force of the system. Michelle: Yeah, it makes absolute sense. It changes your state by using your physiology because you’re using your breath and different rhythms of your breath. And by affecting the physiology, basically, from the outside in, yeah, you’re able to change the state of mind or emotional state that you find yourself. Very much like if you are having a bad day, a crappy day, and some people go out and go for a run or go to the gym and they’re basically changing their physiology. And in changing the physiology, you’re changing…because when you’re running, you’re breathing differently. And so you’re changing how your rhythm patterns and breathing patterns and therefore, you’re able to affect, and all of a sudden, you come back home kind of, like, you’ve cleansed the palate and a clearer mind and a clearer state of being. So, I totally get it. Thank you very much. That was wonderful. Now, I also wanted to talk about a tool that right after I took my first Happiness course, a few months later, actually, it was gonna be happening, and I remember still in the Bay Area, and Sri Sri Ravi Shankar was gonna be there. And it was a five-day silence course that the Art of Living also offers. It’s a retreat. And so I attended my first retreat almost three years ago now, and I have been attending two or three of these per year based on my scheduling. And I cannot begin to describe the profound effects that they have had on my mental and emotional health as well in dealing with anxiety. When I say anxiety, I wanna describe it, meaning dealing with a mind that feels that needs to be in control constantly, that is constantly worried, that is constantly turned on, that when it goes to bed, it keeps on ruminating and going off at night even though you’re supposed to be resting, that kind of a mind. And I think a lot of entrepreneurs can relate to these symptoms, as we’re always thinking about projects, about payroll, about revenue, profit, sales goals. And so we’re also constantly faced with challenges and decisions. And the centerness and the sharpness of mind that I have walked out after five days of, like, complete silence has been incredible. So what happens, because entrepreneurs are all about learning, and so a lot of us decide to go into entrepreneurship. And we have to learn about sales. We have to learn about marketing. We have to learn about hiring. So we’re learners. We love to learn. What does someone learn at a Silence course or what happens in a Silence course and what are the mechanics that you’re bringing the participants through during those five days? Can you actually be in silence and then can I be in silence for five days without saying anything? And number two is, like, if I’m gonna be in silence and everyone else is gonna be in silence, how am I gonna learn anything at this course or at this retreat? So just tell us a little bit about what happens at the Silence courses and what you’re hoping to bring the participants through during the course of those five days. Annelies: I agree with you on both counts. One, when I first heard of taking the silent retreat, I was like, “What? Be silent. That doesn’t sound so much fun. How am I gonna do that?” In fact, my family plays bets. They laughed and laughed, “Oh, let’s see if she’ll make it through it.” I agree with you on the second count, is that it’s my absolute most favorite course that Art of Living offers. It is the most brilliant course. If I could take one every month, I would do it. It’s such an incredible experience and it’s just delightful. By the end, it feels like bliss. If there can be such a thing called bliss, that’s what I feel. So, what I love about Art of Living’s Silence course, which is called Art of Silence is that it’s just brilliantly designed. Sri Sri is a brilliant curriculum designer, but this one takes the cake. It’s so well designed it makes it so easy to go into silence. It’s not that you’re only doing silence. You’re doing some very deep type of meditation on the Art of Silence retreat. And it’s a profoundly deep type of meditation that you’re only guided into once you’re in silence. You’re not in silence the entire time. You have about a day where the group gently goes into silence together and you do so much talking and so much different processes that you kind of evolve once you go in silence. And then the teacher, on the last day, they take an entire day to bring you out of silence. So to me, it’s just really well facilitated. And there’s different processes in the Silence course that help you understand what’s going on in your system, in your mind, in your physiology. There’s not just sitting still but there’s movement. There’s silent walks. There’s some wisdom or knowledge that you listen to so that your mind has a reference point for what you’re going through. But one of the things that I love about it, and I teach a lot of university students, is I find it actually gives you the space and time to come in touch with what is your real purpose here and what is it that you’re doing here and what is it that you really want in your life? And what are the things that you actually don’t really need? And it’s almost, to me, that it gets you into a much broader perspective of life on this planet and also of your own life. And when you have that broader perspective and you’re more in touch with your actual purpose and what things are not part of your purpose, you become a much more powerful and purposeful human being. I think that is good for anybody, entrepreneurs, investment bankers, students, artists. I feel like it really gets you in touch with the essence of who you are and what you really wanna spend time on in your life. I mean, there are really interesting things that are happening even scientifically when you do silence. And I would say for anyone who’s never done a silent retreat, one, I would say don’t go on a 10-day one first. Go on a three or four day. That’s one thing I love about Art of Living’s Art of Silence retreat is that most of them are only four days. Ten days, it might drive you crazy, but at least start with the four day one. And silence actually feels so nice, and it sounds scary and horrible. Once you get into it, you don’t wanna get out of it. That’s what I find. I teach them like every month, and nobody wants to come out of the silence when I say, “Okay. Now the silence is over.” Nobody wants to say anything. Michelle: Nobody wants to say. Annelies: It’s really funny. But I would say science is starting to say that silence is more important than we think. It’s actually more important from the brain…for the brain. And silence helps us to regenerate our brain cells, believe it or not. There was a study, of course. There was one study done on mice and they weren’t intending to really prove anything about silence, but the study involved different kinds of noise and silence. And it was shown, much to the scientists’ surprise, that the mice who were exposed to two hours of silence a day actually developed new cells in their hippocampus. And the hippocampus is the region of the brain associated with memory, emotion, and learning. So in a way, sitting in silence and meditating, you’re actually becoming a better learner because you’re regenerating your brain cells. You’re creating new brain cells. New brain cells are developing. I mean, most of us know that when we’re in sleep deficit, a lot of us are in lack of sleep, sleep deficit, brain cells are dying faster. So I would say, if you’re working really hard, you’re an entrepreneur, you’re a business owner and you’re, like, probably sleeping a little less than you…less sleep than you really need, Silence course is, like, this incredible way in three or four days to just rejuvenate yourself. To me, it feels like a year’s worth of rejuvenation. Three to four days, you get back to your center and you actually get…you have so much more energy than you did when you started. So it’s a way to quickly make up for any of the abuse we’re doing to our system [inaudible 00:23:56]. Michelle: Yeah. I mean, even on a digestive side as well because it’s four to five days where you bring everything to a halt. And the detox is not just mental and energetic, but it’s also physically in that there’s vegetarian meals that are conducive to helping the mind being in silence, which was something completely new to me. I mean, it was, like it rocked my world to find, to know, to learn that there are certain foods that actually trigger, which, of course, we know, caffeine will trigger craziness in your mind and it accelerates your heartbeat and that’s why you’re awake. So I am aware of that. But even to the point of not just in drinks, but there’s certain foods that also will help you to have a more calm mind versus a mind that is more reactive or more prone to anger and so on. It’s a completely rewiring of the system that is happening on it at every level and in a piece like I have never experienced before. And that piece and lingers with you. I mean, for months, I feel, like, it really carries me on until, in my schedule, I had the next one booked already to go on and do my next retreat. Annelies: I also feel that when I am in my own self because I started doing this stuff when I was in my mid-20s. A very curious thing, like when I would take a silent retreat, I would not only feel like more rejuvenated, resilient, more capacity, more productive, but I would start feeling more and more confident in myself, less doubt. It’s bizarre because you don’t feel like you’re adding anything to yourself for there’s no coach in the Silence course telling you, “You can do it.” But there’s something about sitting with yourself. You’re just completely with yourself, and in a way, you get to know yourself better. And all those random constructs that come at you from the world, all the negativity or the doubts, those actually start falling away when you sit in the Silence course. And I find it’s almost like a reboot for your brain. Like, when you were eight years old, you knew that you could conquer the world. You could do anything. You knew it. You knew your capacity was huge. But somehow through our teenage years and young 20s, we pick up so much self-doubt and so much I’m not sure, especially women. When I do research, I notice that 80% of women have low self-esteem issues. I’m, like, shocked by that, but that’s the way the planet is right now. And I feel like, in a strange way, you wouldn’t expect that kind of a result or benefit from a Silence course but that also happens. Michelle: Absolutely, yeah. And the more doubts you have, the more confuse the mind is and the more you go in some kind of a crazy [inaudible 00:26:52]. I can totally see that. Annelies, what I have noticed also in Silence is that just like Silence and just like Sudarshan Kriya, the breath work exercises and…or when I go…my daughter right now is attending Episcopalian Church and they have a singing part where the children are singing, whether it be in the form of prayer or singing or meditating or contemplating or whatever it is. All of these tools are really about stealing the fluctuations of the minds so that we can then really see who we truly are on a much more spiritual level and help us shape a more panoramic perspective of our lives as opposed to being swallowed up by the details in the ups and downs of life. Michelle: …or walks, exactly. And just really even when you’re sitting after your meals, you’re sitting contemplating your meal, really keeping the energy in through the silence and really being very efficient in how you use your energy versus just hemorrhaging it out there by small talk and whatever that we normally sometimes do in our daily lives if we’re just out and about, so really, really, highly recommended. Now, I wanted to get back to…I know you mentioned right now that you’ve taught this also to investment bankers. And I remember in a brief call that you had mentioned that you had had a class of investment bankers there in New York taking this. So how does a group of these high charging guys go in there and how do they come out? Like, can you share the contrast? And by the second day, I will see investment bankers saying like, “Oh, wow, I can see how this would help me in everything. This is amazing,” like they never expected such a result. I guess they felt, oh, meditation sounds like this fluffy kind of thing that you’d sit on pillows and do it. They didn’t expect it to be like a cutting-edge type of thing. So what I love about teaching investment bankers is they are implementers. That’s what I’ve learned. They’re implementers. They do. They make stuff happen. Michelle: It’s like having an unfair advantage, correct. Annelies: It’s kind of like cheating. But, I mean, come on, it’s natural, right? Annalies: Yeah. It’s kind of this unfair advantage. But they would tell me stories that everybody at work was like, “How do you remain so calm on the floor, whatever,” like they’re like, “How are you so like unshaken,” because they said after they did the practice for a while, they just felt they could handle everything without getting upset or crazy or frenetic. And everybody was starting to notice, first, subtly and then finally, they would say something out loud, “How do you remain so calm and unshaken yet you’re doing everything.” Yeah. I love having investment bankers take it because there are such productive people. And it just shows how this short little 25-minute practice can make you leagues more productive and you’re actually feeling better. So I feel like it can give you more longevity in your career. And also some of the research in Sudarshan Kriya is that it boosts your immune system. It boosts your killer T-cells, then it boosts antioxidants in your system. So you actually don’t get sick as much. So I think people who are on a crazy work schedule, it’s such a gift. That’s something…you’re not ingesting anything yet your immune system is getting a kick. Michelle: Now, I wanted to shift the little gears. I know that you had mentioned that you are rolling out and you are heading this project. You’re the founding director of the Sky Campus Happiness Program and you’re in collaboration with about 25, I think, universities, or 35 universities. I can’t remember, recall the exact number here in the U.S., where your basically breath work courses are being taught. Can you tell us a little bit about that and how come even at a university level, university administrators are seeing the need for this? Annelies: Well, I think that for the past five years, at least, the biggest problem on university campuses has been depression. And it’s alarming on how many campuses there are suicides regularly. And actually, it doesn’t get out into the public much. The universities don’t like those suicide raised to get out to the public because it doesn’t make them look very good. But I find out about these because they have to tell the university community and parents of university students find out. So like just last week at Georgia Tech, there were two suicides in one week. And my student leaders call me, “What can we do? This is crazy.” And they’re like, “Everybody should be learning Sky, Sudarshan Kriya,” because they know that people won’t get into depression if they have that practice. But just this year, the problem shifted from depression being the worst problem to now anxiety being the worst problem. So most universities are puzzling, “How do we take care of anxiety?” I mean, from my perspective, I haven’t seen that medication works that well. I’ve had roommates in the past who had it and took medication. It didn’t seem to me. It didn’t seem to, like, really solve the problem. And the other way that they approach it in universities is counseling, the Counseling Center. I mean, counselors do an incredible job and bless their heart. They’re taking care of everybody. But it’s not the very efficient way to take care of thousands of students, 20,000 or 30,000 or 40,000 students because you need a 1-hour or 45-minutes session and it’s one-on-one. And so in every school, we teach our Sky Campus Happiness program. There are month-long waiting lists for counselors, for counseling sessions. And it doesn’t seem like they can put enough counselors to meet the demand. And so I think what administrators are starting to see and what I see is that we can teach a hundred students at a time on a Sky Campus Happiness program and they’re all getting the benefit. And it has been shown through research that when people learn Sky, it is as effective as medication for anxiety and depression. So in three or four days, they’re coming out of their depression and anxiety. And if they keep doing the practice, they stay out of it. And that’s incredibly effective. And then they don’t have to be waiting in line for a month to see a counselor. And who knows what goes on in their mind during that one month when they’re waiting for the counselor. So I think university administrators are starting to realize that we need to approach total well-being for a student. And only meditation I think is not enough. There’s already mindfulness meditation on a lot of campuses, but because one of the big problems is anxiety and loneliness and a sense of disconnectedness on the campuses, there have to be more focused on the total well-being, not only meditation. So in our program, they can’t…Campus Happiness Program, we focus on total well-being. We focus on breathing techniques and meditation for sure. You need the practices to make people learn how to be sustainably happy and learn how to rid themselves of negative emotions. But then we combine it with some social connectedness exercises, emotional intelligence exercises to bring up the compassion and resilience and the confidence in student’s ability to connect with others, because the truth is if you feel connected, you’re a happier person and if you know how to connect. We put those two together. And we also add in leadership and service. So, we find in general that people who take responsibility as leaders like yourself are happier, like when you’re taking responsibility, you have an outward focus. You think about others, what can I do for others? And in general, that service mindset, like what can I do for others, it makes you happier. So we like to combine all those elements. So we feel we’re addressing, like, the total human being. Michelle: Yeah. Even I remember, when I took my Happiness course, one of the projects or to do was to figure out some kind of a community outreach service type of thing. And my group came up out with based on a suggestion of one of the ladies there that was like, “Okay. I haven’t visited my grandma and I don’t know how long. I wish I could. Why don’t we as a group together visit the entire elderly shelter home where her grandma was?” And that was our outreach to the community. And we brought them flowers and snacks. We first called the administrators to make sure that we could bring things that were okay for them and did activities and just sat with them over lunch and spend like two-three hours. Yeah. It takes away the focus from you into serving others and it makes you work in a group, especially if you’re feeling isolated and alone and depressed. I can totally see that working beautifully on campuses. Now, how have these tools…? Right now, if you were to look at your life in hindsight now, how had these tools helped you manifest prosperity, because we at “In FLOW” talk about not just in flows of peace and ease and grace but also in flows of cash and money? How have these tools or how have you seen these tools help someone manifest prosperity into their life? Annelies: I’ll mention one of my students first because it’s on my mind because we were just talking about universities. So one of my, like, top student leaders at MIT, he started an entire club around Sky and he became a teacher of this on his own, which is in a 1,000-hour teacher training. He recently made it into Forbes as an entrepreneur as like the top 30 under 30. And he sent me this beautiful note like, “Thank you so much for all of your training.” And he said, “All of this actually is…” He credits all of this program like Sky Campus Happiness Program and taking the Silence retreats. And also we have a leadership training for university students. He credits it as being the thing that made him into a good leader and someone who can inspire others and helped him become a better entrepreneur because he started his own company. I mean, I was so proud of him because I feel like what these tools can do. They’re not just esoteric and they’re not just things just to give you more energy, but they can actually make you a more prosperous person in the regular outside world. Annalies: Yeah. And how has it made my life more prosperous, is that the [inaudible 00:40:08]? Michelle: Yeah, yeah or if you can walk us through how do you bring in your day, like walk us through a typical day in an Annelies’ life. And how do you bring inflows of grace, faith, light, ease into your life? Annelies: Yeah. [inaudible 00:40:30] But I feel like I can only do that. I can only fly and be in so many different places all the time because of my practice. Anymore, there’s never a day I wake up and skip my practice. I wake up. I do my little bit of physical yoga however much time I have and then my priority is my breathing technique, my Sudarshan Kriya and my meditation. And even if I have to wake up at three or four in the morning because I have an early flight, I will wake up and do it because that’s how powerful the practice is. And I don’t know. I find like I’m the only one smiling at the airport, chatting with the agents. Everybody else is like, “Oh, the flight is delayed, blah, blah.” And I just find like, “Oh, this just…” Life doesn’t have to be a struggle. You can be in the same situation as others and it can be fine. So like you mentioned at the beginning of the call that you’re in flow like I feel like it puts me in flow. And I can get more done on the plane. I can arrive in a new city and just drive straight and teach a course like I don’t need to refresh myself or take a nap or whatever because I’ve done my practices. Sometimes I do my practices on the plane. And he went. And lo and behold, he started doing the practice daily and he just started sleeping at night like a baby, like he dropped it. He decided that, he’s like, “You know what? I’m giving up this alcohol thing.” And he feels so good because of it. He started doing the practice twice a day, not that you have to do it twice a day, but he loves it. He does it in the morning. He goes to work. He used to have a little bit of a short temper. He’s just like a person who gets stuff done, like he’s amazing. He gets everything done [inaudible 00:42:49]. But he also used to be a little testy with people. But now everybody at work notices the difference. Annalies: Yeah, yeah. I feel like it really helps you manifest in the outside world. It really helps you be more clear and centered so you make better and clearer decisions. It helps me be more creative, come up with creative solutions. And when you’re more creative, everything in your life runs better. Michelle: Absolutely, totally. Now, if somebody wanted to reach you and find out more about what you do or get into a Happiness course nearby, like where should we go? What should they do? Annelies: Okay. So our Art of Living website nationally is artofliving.org, so A-R-T-O-F-L-I-V-I-N-G.org and you can find Happiness programs in any city, even small cities. They’re running all the time. We have about a thousand teachers. If someone wants to contact me personally, I have a Facebook page. It’s my name, annelies.richmond. You’d have to know how to spell Annelies, but it’s A-N-N-E-L-I-E-S-dot-Richmond, Richmond like the city. So I answer questions on my Facebook page. Sometimes I answer them by video or you can message me. But, yeah, I cannot highly enough recommend make time in your life to do the Happiness program. It’s like such a gift to yourself, and if you take your spouse, even better, because then you’re both happy. Michelle: Absolutely, yes. Yeah, because it’s like two charged batteries run stronger and faster because if one of the batteries is discharged, it drains the other battery much quicker. So I can totally relate with bring your spouse along, absolutely. Annelies, thank you so much for a wonderful time together. Thank you for being so generous with your time and in explaining to us what’s going on. I even learn myself right now because I’ve always been part of either the retreat or the course in it, but not looking at it from an outside perspective from the teacher’s point of view as to what you’re trying to do with the participants and what’s the end result when you think, “Okay. This was a successful retreat and so on.” So thank you so much for your time. Michelle: Thank you for explaining to us what’s going on, what you’re working on right now at the university level. And thank you so, so very much for making the time. Annelies: Thank you, Michelle. Thank you for inviting me and thank you for being a living example of an incredible entrepreneur doing all the practices. That’s incredible. Michelle: I try my very best. I try to not skip. And you know what? I have to admit, I’ve skipped a couple of days and you notice when you skip a couple of days and everyone around you notice, especially my daughter. She’s like, “Mommy, you’re getting grouchy again. What happened?’ I’m like, “Yes, I need to go back to my practice.” That’s what happened. So thank you very much, Annelies. And I think that is a wrap for today. I hope this episode left you feeling inspired and ready to get inflows of cash, inflows of light, and inflows of faith in your life. I welcome your reviews on iTunes. Please leave me a review and help me create an amazing community of women in flow. Thank you as always for sharing your voice by going to michellebosch.com and joining the conversation about this show. And while you’re there, grab a copy of my “10 Commandments to Living a Life In Flow.” You can also follow me on Facebook at Michelle Bosch and on Instagram @michelleboschofficial. Thank you very much and until the next one.